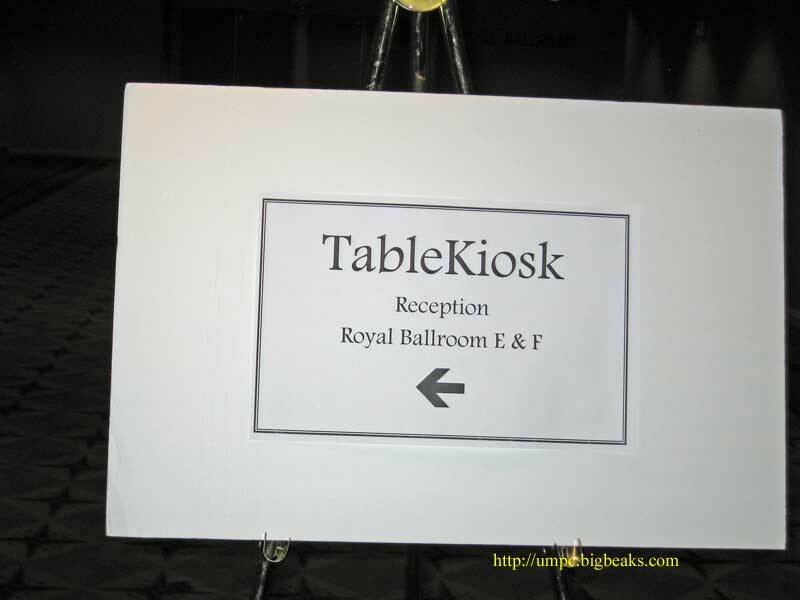 This sign near the hotel lobby directed attendees to the proper location. 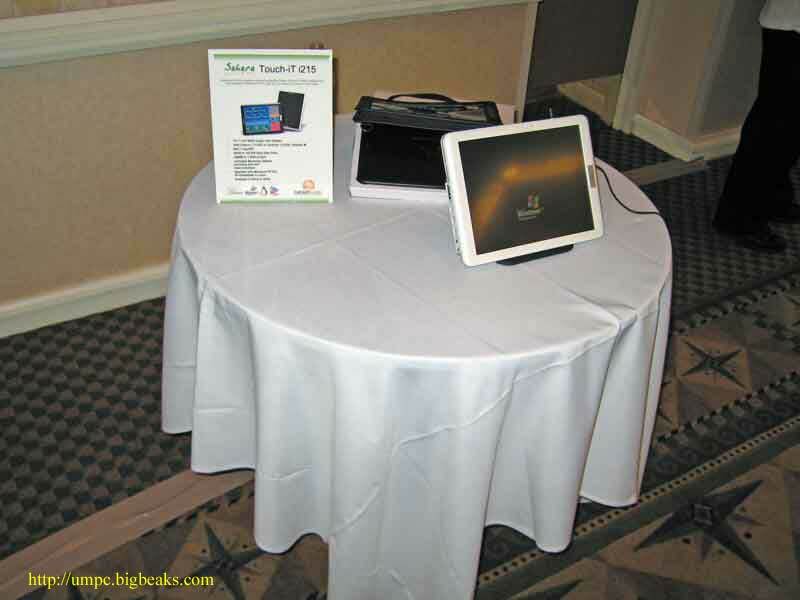 This reception desk was outside the ballroom where the event was being held. 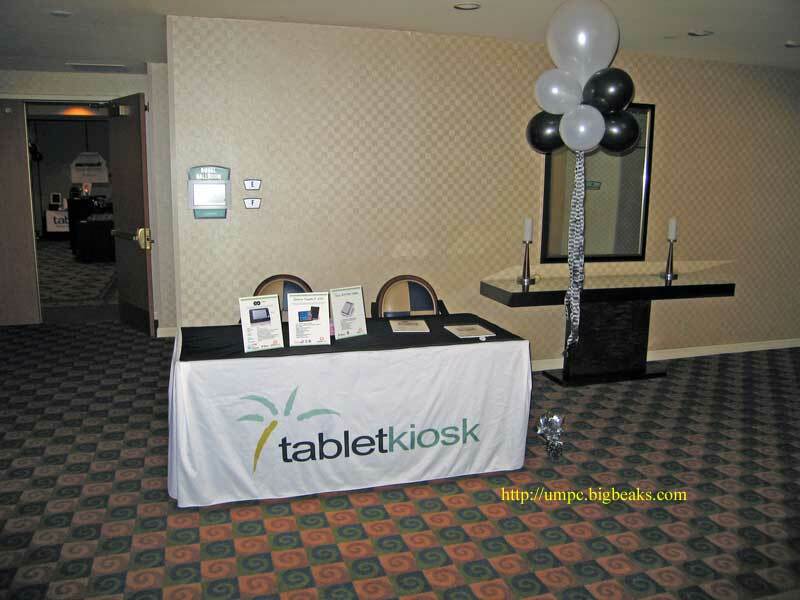 Here guests signed-in (on a tablet PC, of course!) and were issued a ticket for the drawing. 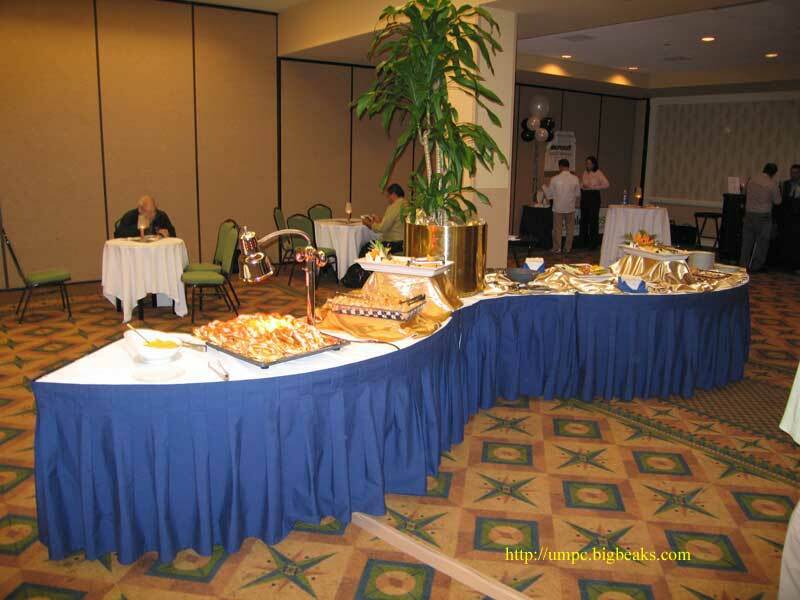 A generous buffet of cheese, crackers, veggies, and even warm, soft pretzels was provided. 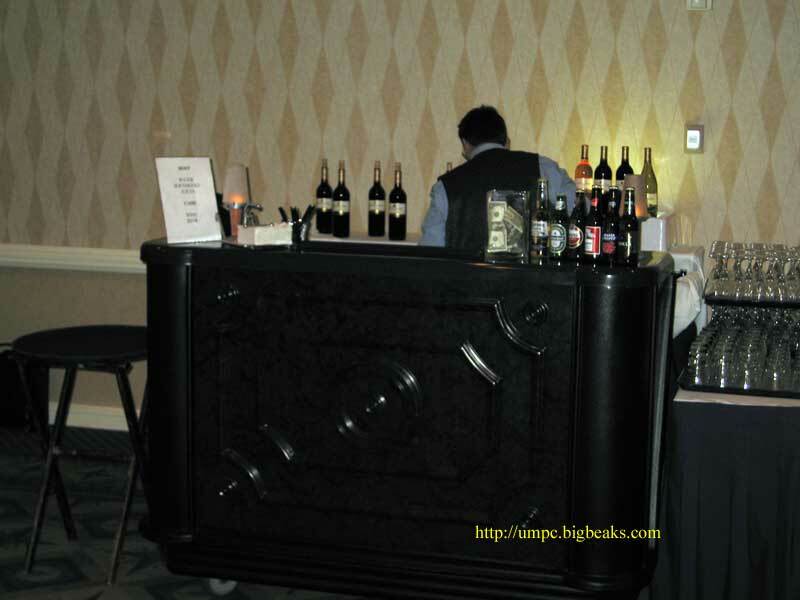 The bar served free soft drinks and water while beer and wine were also available for a fee. 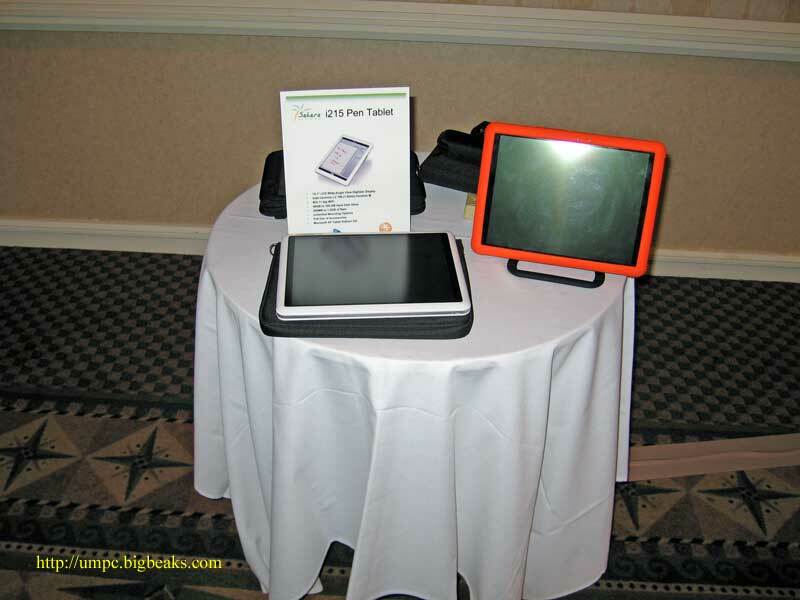 This table towards the front of the room showed off traditional tablets and a few accessories. 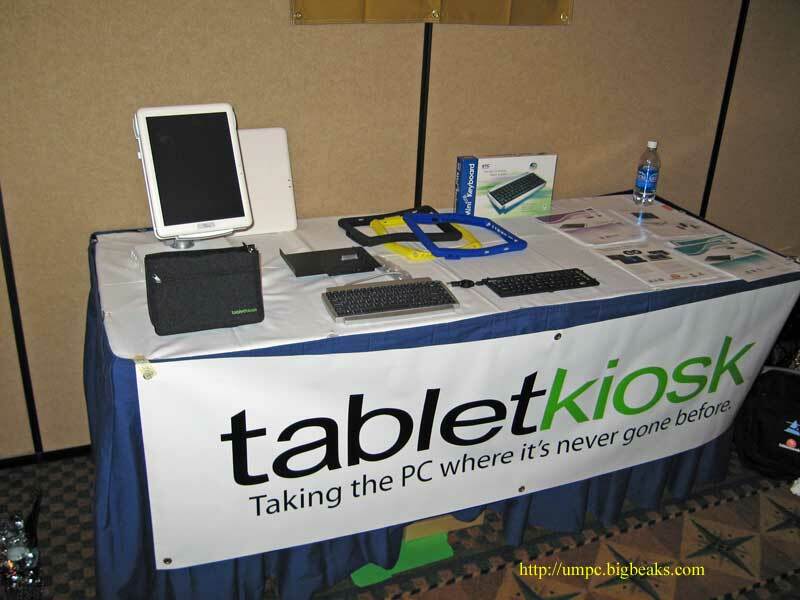 These tables showed several models of traditional Tablet PCs. 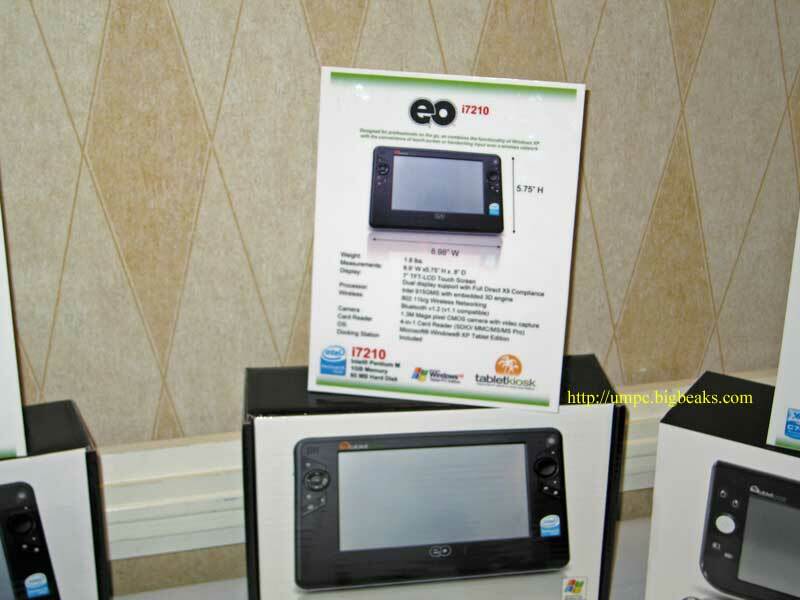 The three current models of eo UMPCs were featured at this table. 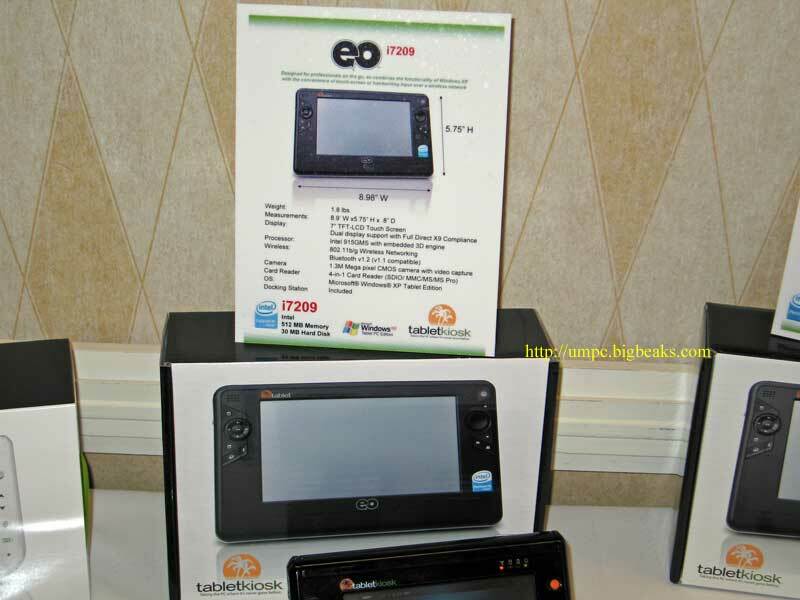 Close-ups of signs describing each of the three currently available eo models. 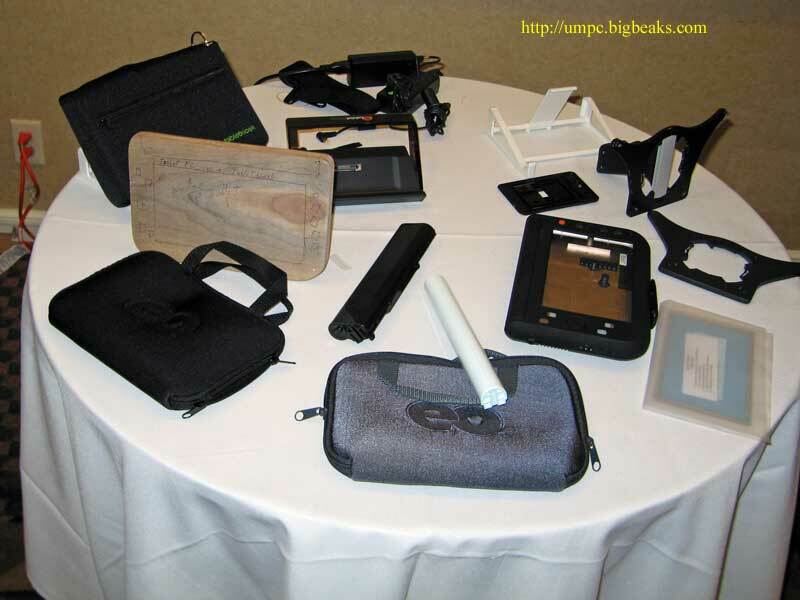 This additional table showed many of the eo accessories, both new and old. 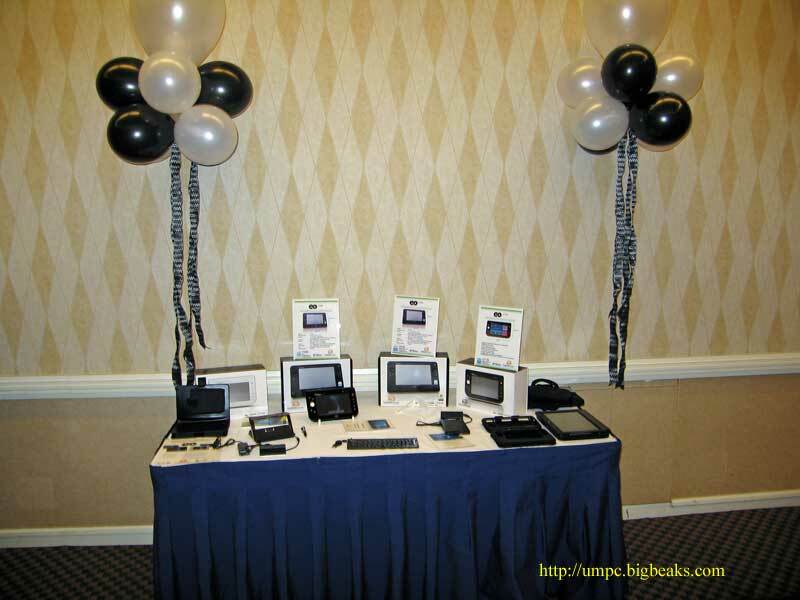 Conspicuous in their absence were the long promised port replicator and docking station for the v7110, although we were assured that the port replicator was at least still coming soon. 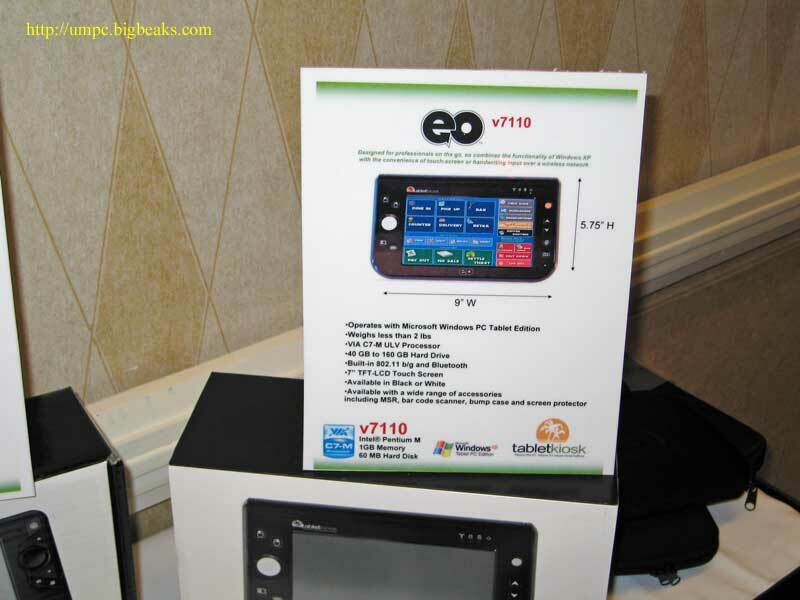 A couple particularly interesting items on this table included a prototype exterior for the eo v7110 and a wooden mock-up of an eo that was being used for demonstrating mounting accessories. 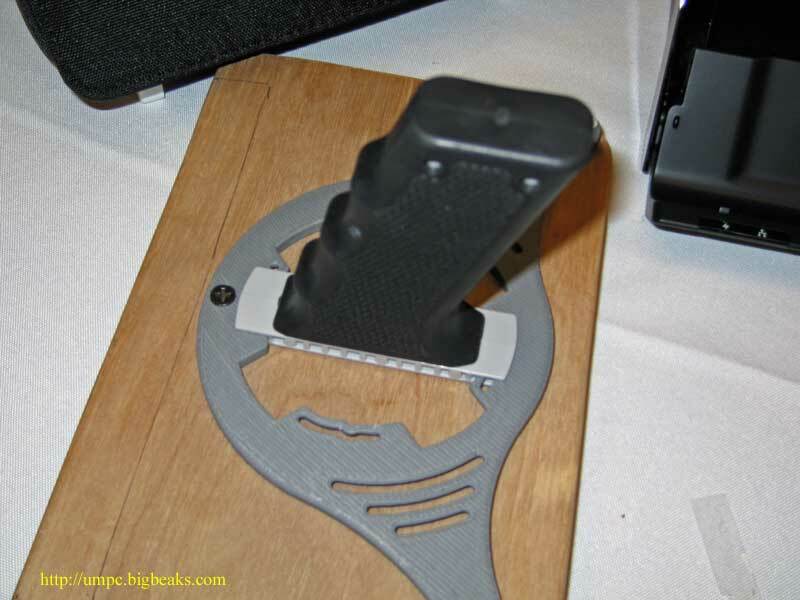 One of the most interesting prototypes on display was this handle grip that attaches to an eo via the universal VESA mount bracket sold by TabletKiosk. 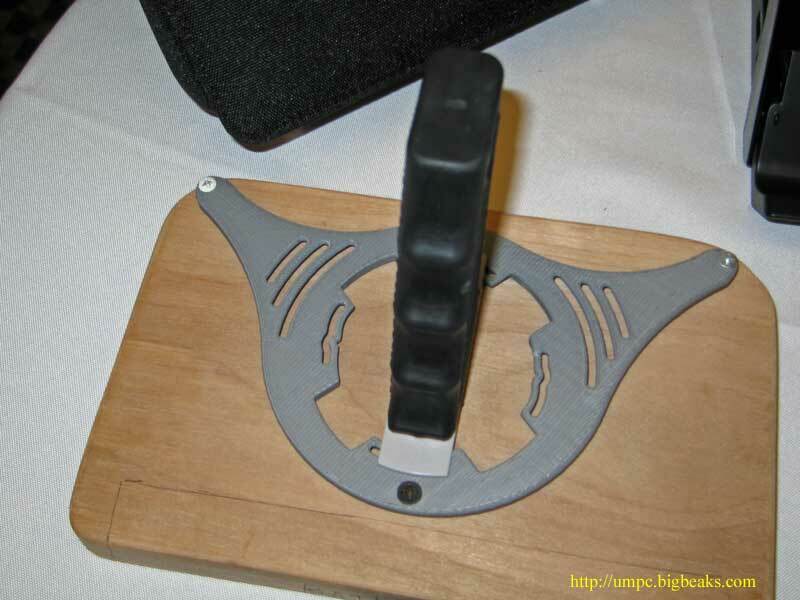 It is intended to allow easy one-handed operation. It is demonstrated here attached to the wooden mock-up mentioned above. 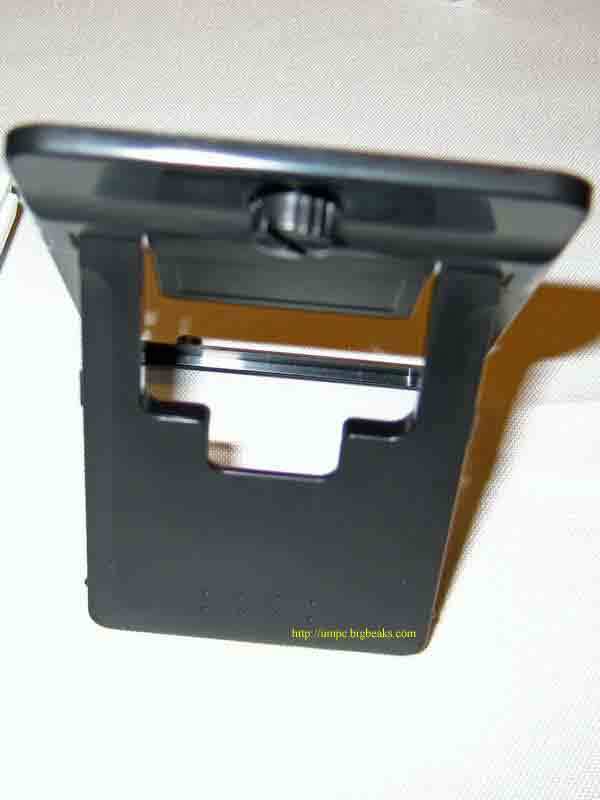 This folding stand attaches to a mounting hole on the back of the eo v7110 using a thumbscrew, providing that model with one of the features that is most frequently cited as an advantage of the Samsung Q1 and the TabletKiosk i-series. The stand was demonstrated attached to the eo, but I unfortunately was not in a position to get a photo at that time and didn’t get another opportunity. I can attest that it appeared to work quite well. I did ask if the stand would also be available in white to match the white case option for the v7110, but was told that wasn’t planned. Their view was that most people wouldn’t be looking that closely at the back of the units, but I do hope that this will be re-considered. 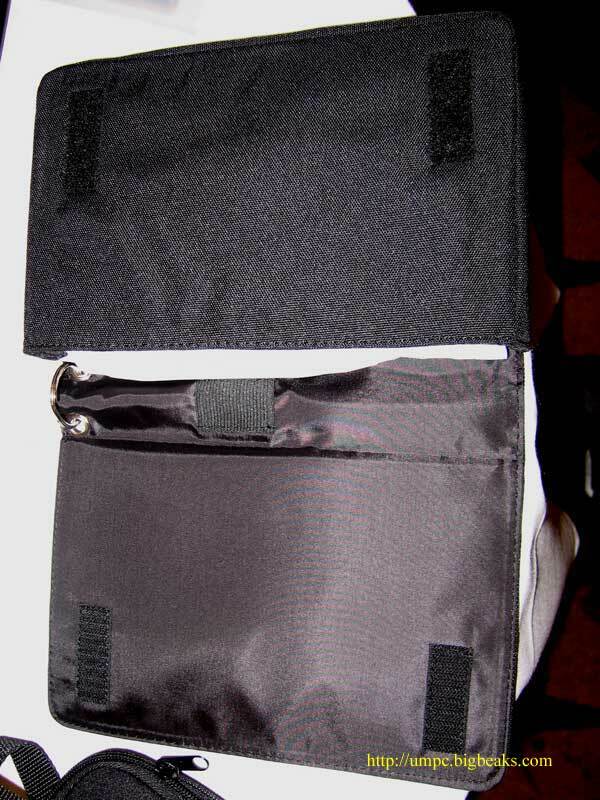 These are protective bump cases for the v7110 (top) and i72xx (bottom) UMPCs. 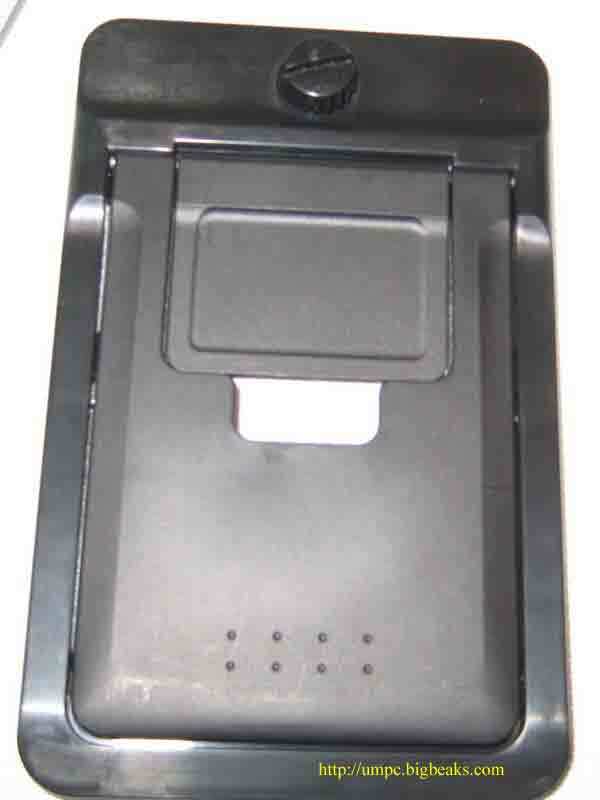 As with the stand, it would be nice if they would offer the v7110 bump case in white as well. 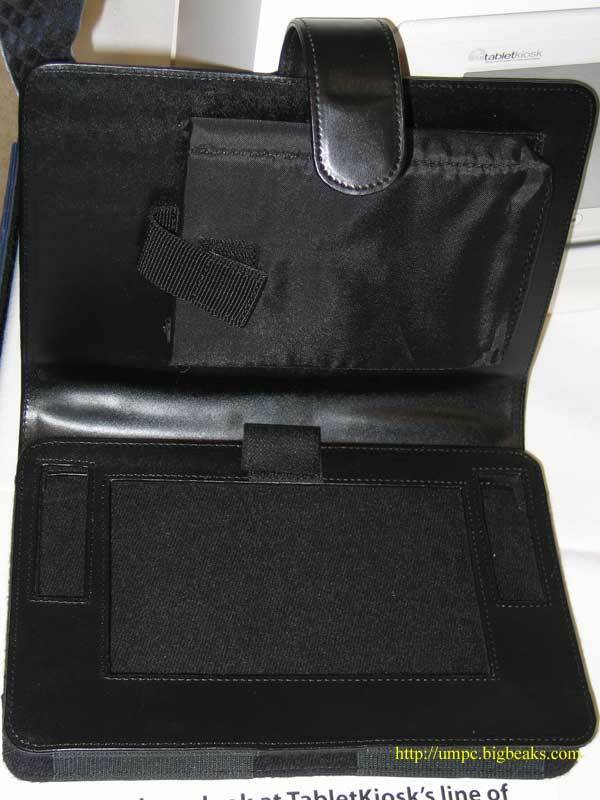 This is a prototype design of a portfolio case with room for an i-series eo on one side and a pouch for a cell phone or PDA on the other. 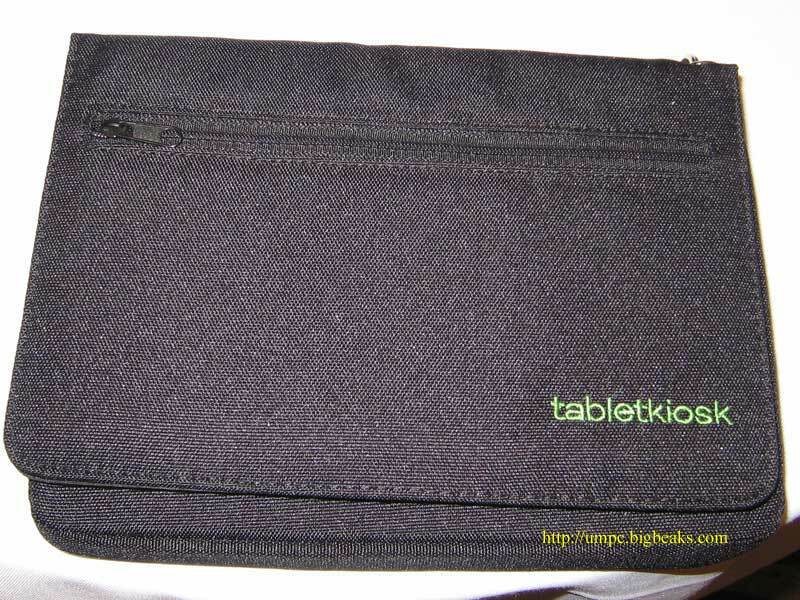 TabletKiosk now sells this Targus USB folding keyboard. 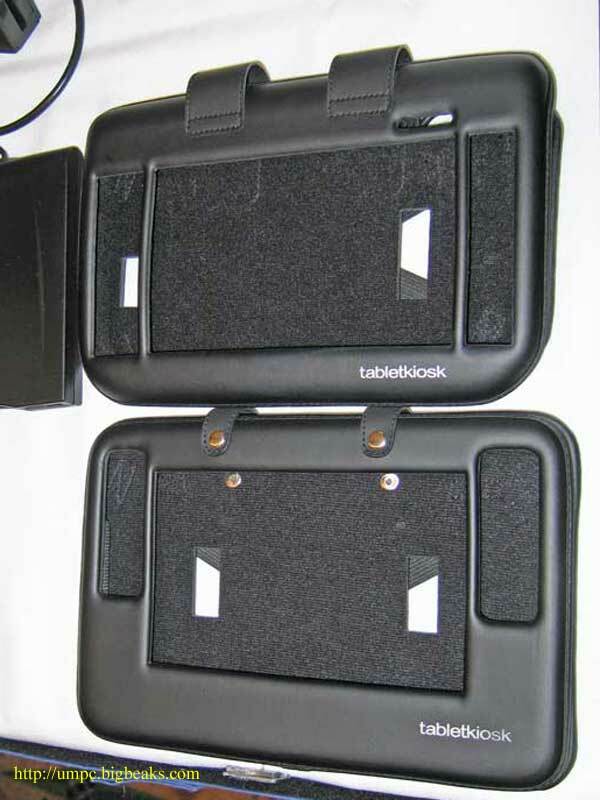 I just purchased one of these earlier this week and will plan to do a comparative report on this and the ThinkOutside folding keyboards in the near future. 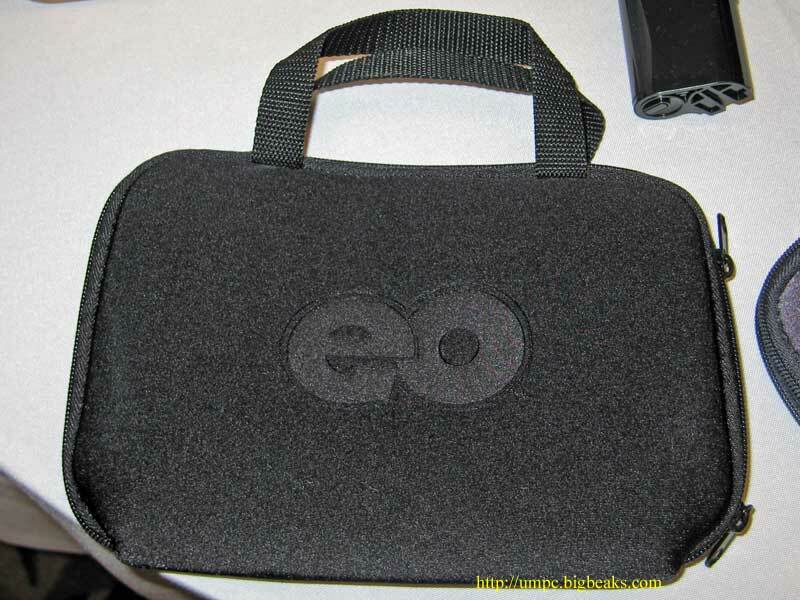 This entry was posted on Friday, October 20th, 2006 at 8:14 pm	and is filed under Accessories, Hardware, Photos, Tabletkiosk. You can follow any responses to this entry through the RSS 2.0 feed. You can leave a response, or trackback from your own site.